Alright, girls, it is our turn to shop for the guys in our lives! Today’s gift guide includes some of my favorite items that make perfect gifts for your man. Composed of things that he wouldn’t usually buy for himself or something that he needs but maybe doesn’t know that he does! 1. Vintage Poker Set: Okay, so this isn’t a need maybe, but heck, it is cool and for the poker lover, would be great for when he has guys night with his friends. Also, its vintage so that automatically makes it that much cooler, and luckily it makes pretty great décor. 2.Monogrammed Toiletry Bag: Guys need a toiletry bag! I don’t know what it is but throwing all their stuff in the suitcase or plastic baggies isn’t an option anymore. This leather toiletry bag can be personally monogrammed and is durable for a guy on the go. 3.Calvin Klien Boxers: The holy grail of boxers, well, so I have heard. Splurge on some pricier boxers for your dude, and, no doubt he will be grateful. 4.Vince Hoodie: This basic hoodie that is high quality is perfect for wearing casually or bumming around. Layer it under denim, leather, or even a sport coat jacket; complete his look with denim and a sneaker! Also if he is going to the gym, this is a hoodie he can quickly throw on with a pair of sweats too. 5. Briefcase: Men are picky about their briefcases, I get it; it is just like women and how we are picky about our handbags. I love this one because of its functionality, durability, yet sleek design. 6.UGG Slippers: Because guys want their toes to be warm and toasty too, these are great for wearing around the house or slipping them on to grab the mail. Plus, they are so comfortable compared to other slippers. 7.David Yerman Bracelet: If your guy is a jewelry guy, there is no better gift than a new piece. This chain bracelet from David Yerman is completely timeless and something that he can wear for years to come. Again, he can wear it casually or to a day full of meetings – or not out! 8.COACH Cologne: Just like perfume, cologne is a personal choice for not only the man but his woman too. COACH has been a brand that I have loved for my hubby. This is a clean scent that is still masculine, but not overbearing. 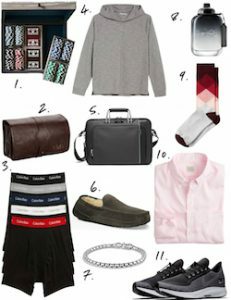 9.Socks: Because a guy can never have too many pairs of socks. How fun are these valentines day inspired dress sock from the Banana Republic?! Love them. 10.J.Crew Pink Shirt: Real men wear pink, right? Hey, I love a guy in pink. It is a fun and youthful color. This button-down is awesome because it can be worn untucked, meaning it is perfect from a day at the office to drinks with friends or family. 11. Nike Sneakers: Every guy loves a pair of new sneakers. This Nike pari is great for working out or casual wear. I love the monochromatic look of them and the shades of black – overall, a great neutral sneaker. That’s all the items I have for you today! Remember you can shop each product in the link below or by clicking each title name of the product and it will take you directly there. Enjoy shopping for the man in your life!